When I posted earlier today, I was aware that Joy and Michael Ibsen who are descendants of Richard III’s mother and who would share the same mtDNA sequence had been tested as being in haplogroup J. At the time, I was unaware of and had not been able to find more details about their DNA tests. Based on this, Joy Ibsen’s haplogroup is most likely J1c2c. J1c2 is pretty definite. J1c2c is based on optional marker 146C, but since we’re already pretty sure about J1c2, then J1c2c is also a good bet. According to Behar et. al. 2012 the estimated age for this haplogroup is about 4543 years old. 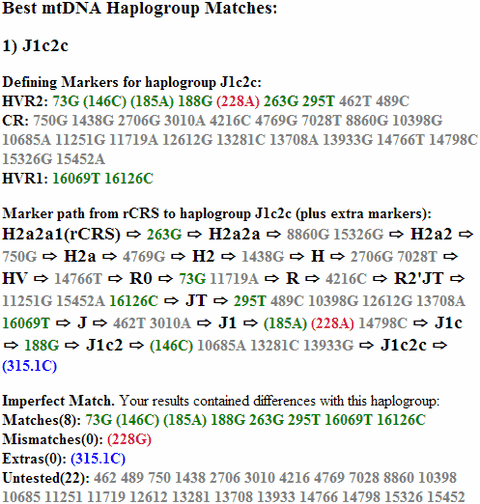 J1c2c2 and J1c2c2a are also possibilities but the defining markers are not included in the sequence. (UPDATE 2: J1c2c1 is also possible; see below.) Note that 228A is missing, but it is an optional marker because reversions are very common within J1c. Now, this isn’t Richard III’s sequence, but I would assume that they wouldn’t be so certain about the DNA matching if they didn’t already know it at least matched this much. Therefore it is likely that Richard III was also J1c2c. We’ll have to wait for more details on his sequence to be released to be sure. UPDATE: This Science News article also says that Ibsen and the Richard III remains are J1c2c. UPDATE 2: The above originally omitted J1c2c1 as a possibility due to lack of the 222T marker. Based on Ian Logan’s observations, 222T is an unstable marker prone to reversion, so lack of this marker is not necessarily significant. J1c2c1a would still be excluded. I’ve been using GigaNews for a while now, mostly because they have a server in Hong Kong which is much, much faster than using US based servers from Taiwan. The downside is that GigaNews is the most expensive service out there with the basic unlimited account going for US$25/month and the top account weighing in at US$35/month. In comparison, most of the other services have unlimited accounts going for US$10-15/month, though sometimes you have to hunt down a coupon to get the best deal. They don’t have all the bells and whistles that GigaNews has, but I don’t use those extra services. I recently cancelled my GigaNews account to try to find a cheaper service that worked reasonably well. After trying a few different ones, only AstraWeb came anywhere close to reasonable speeds, and even that only used a small fraction of my Internet connection’s max speed. While exploring the world of Usenet, one thing I found out is that there are really only four usenet services out there currently, and everyone else just resells service from one of them, or is an alternate brand for one of the major providers. So that led me to look at what other names GigaNews is being sold as, and the answer turns out to be PowerUsenet, and usenet.net, both of which have a basic unlimited account for US$15/month and a high end account for US$20/month. UPDATE: Rhino Newsgroups is another, but their retention is fairly limited at 200 days. I signed up for the basic unlimited account at PowerUsenet and configured my usenet program with the server details… and was immediately disappointed to find that it was connecting to a slow US based server. No problem! GigaNews had a similar issue. They let the DNS server figure out the best IP to use, but it seems to give out the US address sometimes instead of the closer Hong Kong IP address. After some poking around with DNS tools, I was able to figure out the Hong Kong IP address. Once I plugged that in, my usenet client was downloading full speed! Posted on 2010年2月14日 / 2010-02-14 Categories 沒有類 / UncategorizedLeave a comment on Tweet! Tweet! Posted on 2010年2月10日 / 2010-02-10 Categories 沒有類 / UncategorizedLeave a comment on Tweet! Tweet! Posted on 2010年2月8日 / 2010-02-08 Categories 沒有類 / UncategorizedLeave a comment on Tweet! Tweet! Posted on 2010年2月6日 / 2010-02-06 Categories 沒有類 / UncategorizedLeave a comment on Tweet! Tweet! Posted on 2010年2月2日 / 2010-02-02 Categories 沒有類 / UncategorizedLeave a comment on Tweet! Tweet! Posted on 2010年1月31日 / 2010-01-31 Categories 沒有類 / UncategorizedLeave a comment on Tweet! Tweet! Posted on 2010年1月29日 / 2010-01-29 Categories 沒有類 / UncategorizedLeave a comment on Tweet! Tweet!